That makes the Catalans just the eighth club anywhere in the world to have won their main domestic knockout trophy thirty times. Top of the ranking are FC Vaduz winners of the Liechtenstein Cup on a massive 45* occasions. They’re followed by Linfield (Northern Ireland, 43), Celtic (Scotland, 37*), Al-Ahly (Egypt, 36*), Muharraq (Bahrain, 33), Rangers (Scotland, 33) and Selangor (Malaysia, 33). But what’s so impressive about Barça’s record is that, based on the quality of the teams involved, it’s been achieved in one of the most competitive cup tournaments in the world. If we focus on what are traditionally known as the ‘Big Five’, Barça are head and shoulders above the rest. Second and third in the list are two other Liga sides, Athletic Club with 23 titles and Real Madrid with 19. In Germany, Bayern Munich have ‘only’ won the DFB Pokal 18* times. 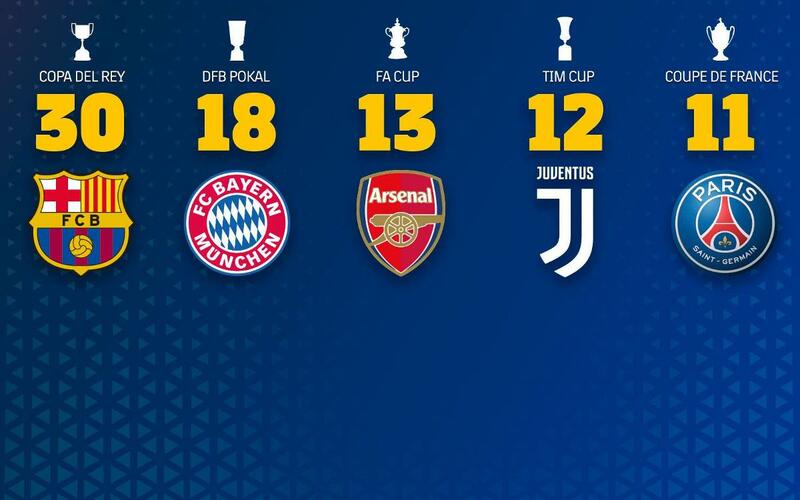 Arsenal lead the way in the oldest competition of all, the English FA Cup, with 13 titles, Juventus have won the Coppa Italia on 12* occasions, and Paris Saint Germain can boast 11* victories in the Coupe de France. As nobody will need reminding, this was also Barça’s fourth Spanish Cup in a row, thus matching the runs of Madrid FC (now Real Madrid) back in the infancy of the competition (1905 to 1908) and Athletic Club (1930 to 1933). To underline just how awesome that is, no club has ever won any of Europe’s other biggest domestic cup titles four times in succession. However, and rather curiously, both Juventus and Paris Saint Germain will have the chance to do just that when they face AC Milan and Les Herbiers, respectively, in the Italian and French cup finals in May. But Barça still have a long way to go before beating the world record of 14 consecutive Liechtenstein Cups won by FC Vaduz from 1998 to 2011! No other club has ever won more than seven cups in a row, a record shared by Djoliba AC (Mali, 1973-79), Pakhtakor Toshkent (Uzbekistan, 2001-07) and SKA-PVO Bishkek (Kyrgyzstan, 1997-03). As for current streaks, and after MS PDB failed to secure a seventh consecutive Brunei FA Cup earlier this month, there are only two clubs anywhere on the planet who have longer winning streaks than Barça! One is FC Vaduz (again!) who’ll be looking to make it six in a row in this year’s Liechtenstein Cup Final, and the other is Red Bull Salzburg, who would make it five in a row if they beat Sturm Graz in the Austrian Cup Final next month. *Teams marked with an asterisk are still involved in the current edition of their domestic cup tournament.